Dan Schoening Easter Egg Hunt: Martin Short and…Grandma Winslow??? 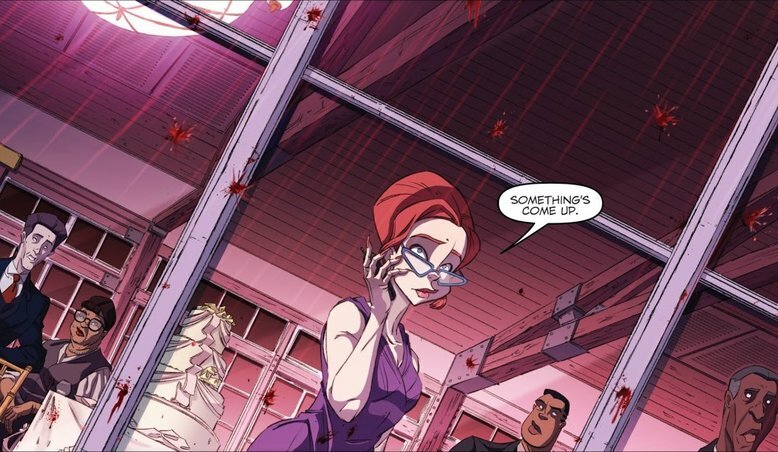 This hidden gem comes to us from 2014’s Ghostbusters #14, and the wedding of Winston Zeddemore. The boys in gray are about to face the heart-wrenching wrath of Tiamat. But in the meantime, Winston has some really interesting wedding guests. I’ve always remembered this panel because Schoening slipped in, of all people, Rosetta Lenoire. Modern audiences know her best as Grandma Winslow from Family Matters. And low and behold, there she is in her Family Matters get-up. It somehow makes sense, doesn’t it? On the show, her son was Chicago Police Officer Carl Winslow. Carl was, of course, played by Reginald VelJohnson. VelJohnson also had a small speaking role as a prison guard in Ghostbusters. If you know enough to connect the dots, that’s an epic ’80s reference. Then it was pointed out to me that standing next to her is Frank Eggelhoffer, Martin Short’s character from Father of the Bride. Yeah, I had no idea on that one. Makes me think I need to go back and watch that movie again. And because we needed another ’90s reference, Schoening threw Roland from Extreme Ghostbusters in as well. Happy to see the team at IDW giving that show some love. Highly underrated, in my view. This entry was posted in Comic Books/Graphic Novels and tagged Carl Winslow, comic art, comic book art, comic books, Dan Schoening, Dan Schoening Easter Egg Hunt, Easter Eggs, Erik Burnham, Extreme Ghostbusters, Family Matters, Father of the Bride (1991 film), Frank Eggelhoffer, Ghostbusters, Ghostbusters comics, Ghostbusters: Mass Hysteria, Grandma Winslow, IDW Publishing, Janine Melnitz, Martin Short, Reginald VelJohnson, Rob Siebert, Roland Jackson, Rosetta Lenoire, Winston Zeddemore on 08/01/2018 by primaryignition.